On a trip to see my parents a couple of years ago Mr T was just starting to use individual words. He had aninclination to create his own names for certain things, the most memorable of which was ‘abudah’ for ‘car’. Unfortunately, that word has now been replaced by the more conventional ‘car’ or ‘carro’, but there is one word from that time that has stuck around and, I daresay, is likely to be with us for a while yet. We were in Ireland walking down a country lane from our hotel to the town of Athenry when Mr T started shouting what sounded like ‘dodo’. The pronunciation was remarkable similar to the long extinct animal, except there was more stress on the second syllable. It was quite obvious that Mr T wasn’t referring to a stupid bird that was a great meal for sailors in the 17th century, but we had no idea what he was actually talking about. After a few seconds, and an increase in decibels, it became clear that Mr T was actually trying to get his granddad’s attention. Ever since that day everyone has referred to my dad as ‘dodo’. There were lots of theories as to why Mr T should choose have chosen this name. Among them included the fact that ‘dodo’ is similar to the Portuguese word for granddad: ‘vovô’. Personally, I didn’t think this was true because I wasn’t sure Mr T had made the connection between his granddads in Brazil and the UK having the same relationship to him. Portuguese also provides us with ‘doido’, which is a word similar in meaning to ‘fool’. It’s possible that this was what Mr T had in mind, although it wouldn’t be very flattering to my dad. It was a source of family discussion, with no answer being possible and so lots of theories could be floated. We had almost decided to just let it go and live with the word when my brother and I stumbled upon another possible answer, or perhaps just a strange linguistic coincidence. In the first week of our holiday in the UK before Christmas, we went for a great curry in a place called Kababish in Moseley, Birmingham. After the great meal, my brother and I decided we fancied a few extra beers, and so went to a pub around the corner. We happened to find my cousin and her husband propped up at the bar and so proceeded to have a great evening swapping stories with them. One story was how Mr T was calling his granddad ‘dodo’. To our surprise, my cousin’s husband thought this was the most natural thing in the world. He was originally born on the Isles of Arran, just off the coast of Galway in the west of Ireland. In that part of the world Gaelic is still used as much as, if not more than, English. And it turns out that the word for ‘granddad’ in Gaelic is ‘daideo’ which sounds suspiciously like ‘dodo’. Now, we were in Ireland when Mr T started using this word. However, none of my family speaks any Gaelic so he wouldn’t have heard the word from them. There is a slight possibility that he heard somebody else use the word, but would he have associated it with a name for his own granddad? Unlikely. Maybe it was just the Irish air or the Galtee sausages? 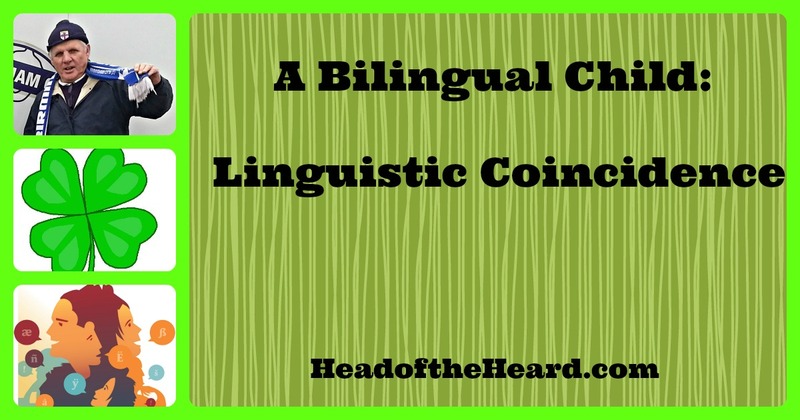 A linguistic coincidence is occurs when two languages have the same word, or sound, for the same thing. Of course, many languages are related, so often it isn’t a coincidence at all. For example, the English word ‘excellent’ is similar to the Portuguese word ‘excelente‘, but this isn’t because of any coincidence, but because both words share a common Latin root. By some estimates, there are over 3, 000 words which are remarkably similar in English and Portuguese, and you can find a list of some of them here. Instead, a linguistic coincidence is when two languages have the same, or similar word but there is no connection between them. There is an amazing list of linguistic coincidences on Johanna Hypatia’s blog. Looking at this list I was firstly amazed at how many coincidences there are. But thinking about it again, for al the words that exist in all the languages in the world, statistically speaking there has to be some overlap between languages. And so that is where I think our ‘dodo’ or ‘daideo‘ comes from. It is purely a linguistic coincidence that we will be marvelling over every time we get together as a family and can think of nothing else to talk about. All I have to decide now is how to spell it.